In the historically African-American neighborhood of Sweet Auburn in Atlanta, the Martin Luther King Jr. historical complex is a set of buildings across a sprawling area that covers several city blocks, some of which are owned and run by the National Parks Service (the National Historic Site) and some still maintained by the King family (The King Center). This complex includes the National Parks Service Visitors Center, King Birth Home, the Park Bookstore, the Historic Ebenezer Baptist Church, Dr. and Mrs. King’s tomb, Freedom Hall, and a Historic Fire Station. The day I visited the complex, I was accompanied by two of my colleagues for part of the time, and I was committed to visit each historically significant facility that I could. We started in the National Parks Service Visitors Center that houses some King artifacts and features the “Courage to Lead” exhibit made up of Plexiglas panels and video footage chronicling highlights from King’s role in the Civil Rights Movement. One element of this exhibit that I haven’t seen at any other museums was the integration of museum labels designed for child readers, child height, all in blue, unlike the other gray labels for taller, more mature readers. 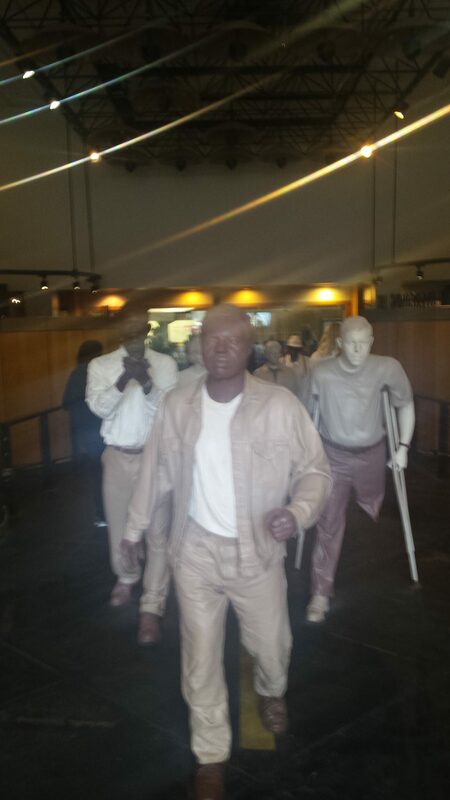 This exhibit encircles a display in which life-size statues of marchers in motion are ready to be joined by visitors of the center who can stand amongst them and listen to recordings from The Movement. 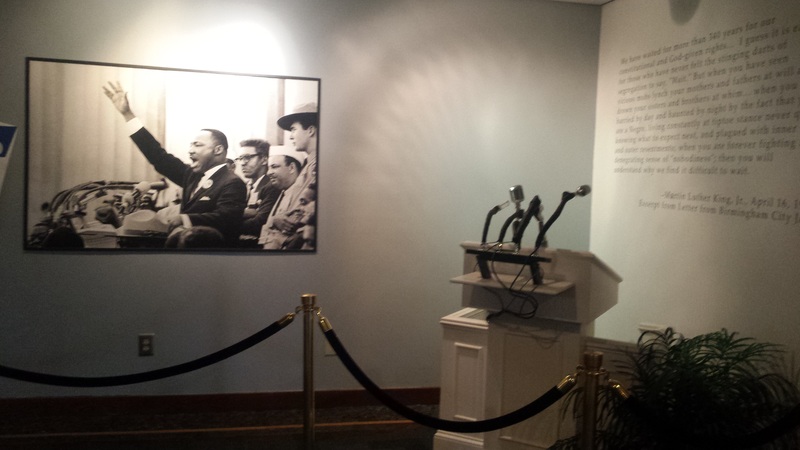 The Center even houses a few artifacts like the podium at which King gave his famous “I Have a Dream” speech at the March on Washington and the wagon on which mules drew his casket. Beside the podium is a description that offers background information about the March. 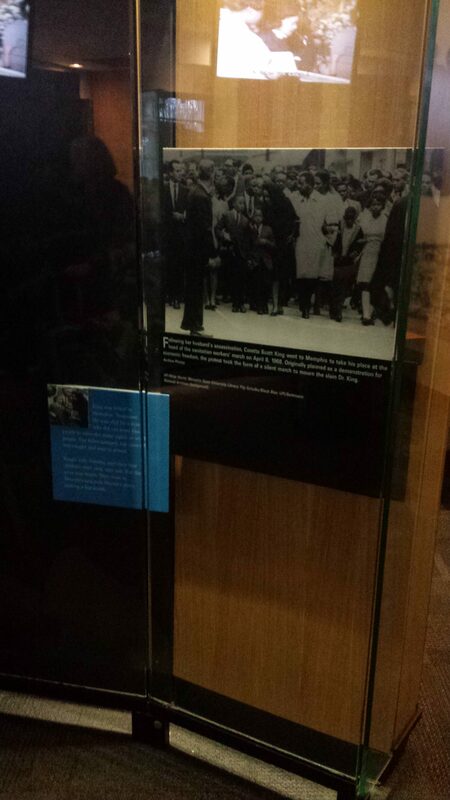 From reading it, I learned that King joined the March Committee late in the game after A. Philip Randolph had already been planning the March for months. Randolph actually introduced the concept of the March on Washington in 1941 to protest unfair government hiring practices during World War II. Along the back and side walls is a timeline of King’s life, and from that timeline, I learned that in 1966 King refused to sign a statement condemning the concept of “black power.” I also learned more in this exhibit about the Poor People’s Campaign, which had just gotten underway in 1968. 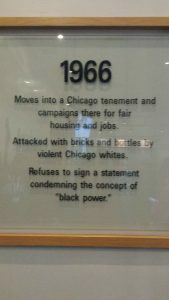 The goal of this was ending economic inequality; it was designed to cross racial lines and address poverty among all ethnic groups. Over the years, I have heard conspiracy theorists speculate that US government officials found this particular campaign too threatening, and that it was not a coincidence that King was assassinated in the midst of planning it. As we left the Visitors Center, we watched as more and more groups of school children of all ages filed in. We realized that there were probably school groups headed to the King Birth Home that opened to visitors at 10:00 where we were headed next, so we hurried from the Center in an effort to beat the rush. 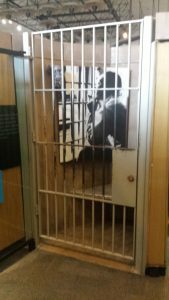 Check back for the next post from my Atlanta series about the King Birth Home, Historic Ebenezer Baptist Church, and the King Center’s Freedom Hall. This entry was posted in Blog and tagged African American Museums, Black museum, Clare Norris-Bell, Ourmueseums. Bookmark the permalink.